Rickenbacker International Corporation announces the acceptance of orders for the Roger McGuinn Limited Edition. The instrument is similar to the twelve string guitar Roger McGuinn used during his days with the quintessential rock group the Byrds, which helped mold the sound of the 1960's. The company has introduced its newest limited edition as the "Secret Weapon on the 60's" because it contains customized electronics and circuitry which Roger developed and installed in his original instruments to produce the distinctive sound which set a standard for twelve string guitars and survives in today's music. The customized electronics is being offered for the first time by Rickenbacker. The handmade instrument offers a number of features which make it stand out in the Rickenbacker product line including a hand shaped 1960's style "fast action" neck; 21 fret full inlaid rosewood fingerboard; three vintage Toaster Top�pickups; semi hollow body and neck made from solid maple; Rickenbacker's exclusive dual truss rod system; the revolutionary 12 string bridge; checker board binding; plus, Roger's customized electronics and circuitry. The instrument is available in Mapleglo, Fireglo and Jetglo. 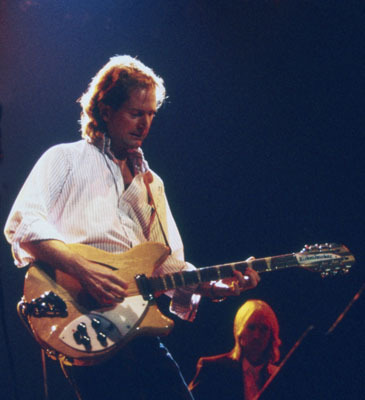 Roger McGuinn has authorized the Company to manufacture 1000 of these unique instruments world wide. The guitars will be individually numbered and accompanied by a Certificate of Authenticity and Origin hand signed by Rickenbacker President, Mr. John Hall. [Now Chairman and Chief Executive Officer] The first 250 certificates will be signed by Roger McGuinn. "I haven't been so excited about a guitar in years. This guitar is hand made in America and incorporates some features that I've always wanted but haven't been able to find until now. The active circuit faithfully reproduces the sound that we used to take hours to perfect in the studio. The 12 saddle bridge allows for perfect intonation up the neck. I hope you enjoy playing it as much I do." The Company will officially introduce the instrument at the 1988 Winter NAMM show in January. The list price is $1,399, with a custom hardshell case at $129. An optional version without enhanced electronics is available at $1,299. Instrument numbers will be assigned as orders are received.